Saturday night all 4 Greenbeans curled up on the recliner and watched a double feature. Not just any old double feature, mind you. We watched Footloose, twice. Once was the original 1984 version and the other was the new 2011 version. For another perspective, check out my “like totally awesome” wife’s blog on the same double feature viewing. She blogs about the 80’s, so it was right up in her totally tubular wheelhouse. Before I get into the specifics of what is on my mind; let me just put in digital ink what I thought about the movie aspects. First, the 1984 version is far superior to the remake. Second, no one should ever, ever try to out Kevin Bacon Kevin Bacon. Third, the remake ruined most of the songs from the original by speeding them up, slowing them down, or countrifying them. Fourth, racing buses? Really? Okay, now my film critiquing is out of the way, I find that my perception of what the film is all about has changed. I haven’t seen Footloose since the mid 1980’s when I was in high school and middle school. Back then, I distinctly remember identifying myself with the cool, non-conformist, outsider who rebels against authority and old religious structures. Now, when I see the film, It amazes me how I identify more with the old religious system and the father who is trying to cope with the loss of one child while attempting to protect the other one. I understand the adults in the film far more now. I see all their actions as metaphors for not wanting our children’s innocence to vanish, and I’m at least emotionally on their side now. I also watch a movie like that with a special perspective on the pastor. Both films open up with the pastor preaching in his church. It is a part of that montage where the setting is established. Watching the movies back to back the way we did, one of the things we noticed is that the dialogue was almost identical. Not much was changed. Except in the content of those opening sermons. John Lithgow (who outperforms Dennis Quaid by leaps and bounds) preaches a sermon about sin and judgment and that the people are being tested to not give into the sinful world. He argues that God could wipe the people and the sinful behavior out if he wanted to, but God chooses not to because he uses sin as a test. The pastor indicates he intends to pass the test and to help his community past the test as well. In the remake, Dennis Quaid’s sermon is much more friendly. He waxes eloquently about the dehumanizing nature of “progress” and insists that he prefers a simpler way of life. John Lithgow is Jerry Falwell. Dennis Quaid is Joel Osteen. It is hard to root for either one. However, what I love is that extra touch in the original film, which was oddly cut in the remake, is the discussion about book burning. There is even a reference to Kurt Vonnegut. In the original, Reverend Moore is against the burning of books and the stance against it helps humanize him and lets us see that he is not evil or a killjoy. He is simply a dad who over-reacted in the face of loss. However, the total best part of watching it was hearing my youngest daughter repeatedly say, “That’s inappropriate” at what she was seeing on the screen. You are always ahead when you can relax some and know what you are instilling in your children must be taking. you are so right gloria. that was the best part-just being with my family. thanks for the nomination! i love your blog too! I almost agree with you, however I believe that their is one aspect that touches mewith the remake. The fact that they make it so you can understand where the kids are coming from too. Ren lost his mom and instead of taking it out on everyone he went and dealt with it in his own way. Yes I see where they ruined the songs but they made it for people that needed to see it for the generation now. brittany, THANKS FOR READING THE POST! i agree with you in a lot of ways. every generation can and should interpret art in a way that speaks into their own culture. 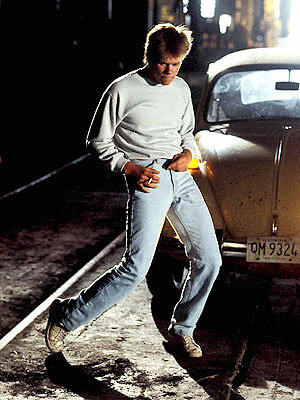 however, i don’t think the new footloose actually goes far enough with that motif. i actually believe more about the basic plot and music should have been changed and updated.